Changing weather can impact your joints. As fall approaches, there are plenty of things to get excited about enjoying during the new season. The changing leaves, extra layers of clothing and pumpkin spiced everything make it simple to get cozy throughout autumn. The drop in temperature may also inspire you to spend more time outdoors while exercising. It's important to remember that changing weather can impact your joints, according to the Arthritis Foundation. Low temperatures can increase the thickness of fluid in the joints, which can make it more difficult to move around if you're living with arthritis. 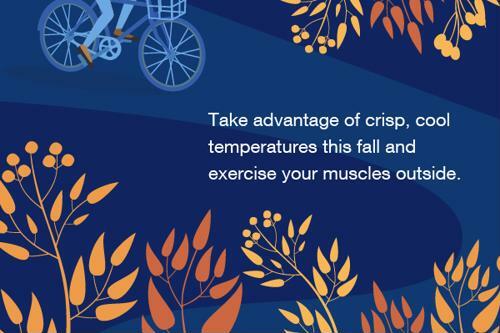 That doesn't necessarily mean you can't get active outside this fall, however. Low-impact physical activity can be very beneficial for those with this debilitating disease. Walking is the perfect low-impact option for strengthening your muscles, reducing stress and relieving pain associated with arthritis. With the new season comes an abundance of locally sponsored walks and races, so why not participate? Find one that supports a charity that's dear to your heart so you can walk with a purpose this season. Just as walking in a 5K can benefit your body, taking a hike along your favorite nature trail is ideal for getting in your exercise while basking in all the changes the season has to offer. Just be sure you stay along the flat dirt or level path, as suggested by Davis Reyes, assistant manager of the Joint Mobility Center at the Hospital for Special Surgery in New York City. "Walking on uneven terrain can aggravate arthritis in your hips, knees and feet," Reyes told the Arthritis Foundation. While gardening is most often associated with summertime, there are so many delicious seasonal vegetables you can harvest just in time for fall. So keep up with this hobby! What's best about gardening is it's a stress-relieving option that can also relieve pain associated with arthritis – you just have to take extra precautionary measures. Using a knee pad or scooter wagon and long-handled tools gives you more versatility and helps make gardening more comfortable. It's also important to remember to take breaks more often – too much stress on your joints for a long period of time can exacerbate arthritis pain. Make time to sit back, relax and admire your garden! Cycling is another option that works the legs from the hips down to your feet. Too much time spent on the bike may aggravate your knees, so make sure you listen to your body and know when it's time to take a break. If you need more support while you exercise this fall, consider one of the many IMAK Compression products offered by BrownMed. The Arthritis Knee Sleeve, Elbow Sleeve and Shin Sleeve are all designed with breathable cotton material and provide mild compression for warmth to increase circulation, reduce pain and aid the healing process. Learn more about IMAK Compression products today.